When did macaroni become pasta? A reader of mine, Frankie, made a comment on a previous blog I posted about a poem he heard from Michael Savage, a radio talk show host, called “When did Spaghetti Become Pasta?” I listened to it on YouTube and it only confirmed that I’m not the only one who thinks it’s crazy on how we follow trends and fads and how much we are willing to pay for it. I touched on this subject on two of my previous blogs of April 24 and July 13. When did macaroni become pasta? How can a plate of macaroni, that cost pennies, be made into a dish that is called pasta and we are willing to pay $15 to $20 a plate? Spaghetti with garlic and olive oil, Macaroni and beans, two staples from a humble Italian kitchen is served up at a trendy Italian restaurant and we pay up to $15 for it. Italians eat macaroni, almost on a daily basis, because it was an inexpensive way to nourish themselves. The Italian kitchen produced many ways to flavor this starch, mainly with tomatoes and herbs, and added it to meals in order to stretch the food budget. Today we pay top dollar to be served those same dishes. I rarely order pasta when I go out to eat and when it’s served as a side dish I usually push it off to the side. I make macaroni all the time. I don’t need a dish of it when someone else is cooking it, and not quite as good as I can make it. But it doesn’t end with macaroni. When did Pizza become a billion dollar industry? When did a 25 cent slice of dough with a smear of sauce and sprinkle of cheese turn into a “gourmet pizza” at $3 a slice. Who said you can put pineapple and ham or a tossed salad on it and still call it Pizza? Who said you can put spaghetti and meatballs in a can and call it Italian food? Am I the only one that feels this way? Americans are great at taking something and making it their own. And they have taken the prize at making Italian-American food. I saw a show on the Food Network the other day. One of their celebrity chefs was making a simple dish at his restaurant of spaghetti with marinara sauce. And as he served it to his diners they were in a state of ecstasy when they tasted it. It’s spaghetti with marinara sauce! I’m sure he used fresh tomatoes and fresh basil and twisted the spaghetti as he plated it for his guest. But at $15 a plate? I don’t think so. I think as a society we have lost sight at how delicious food can be. We eat mass produced food from chain restaurants that taste the same in New York as it does in California. And we find comfort in that. We lost the individuality of local eateries. Of chef owned restaurants that cook their own food back in the kitchen. I’m amused when I peak into the kitchen of an Italian restaurant and see everyone but Italians preparing my meal. I’ll never forget the time when I was visiting my cousins in San Fransisco and went into a pizzeria and saw a Chinese gentleman making the pizza. Even at 12 years old I thought that was odd. I never had Chinese pizza before. America is a melting pot. And Italian food has become as American as apple pie, which actually is an English dish that goes back to the 13th century. You see what I mean? We can take any food from any country and make it our own. That is why when I go out to eat at an Italian restaurant I’m always disappointed. Because I set the benchmark too high. I have eaten dishes all my life from my mother and grandmother’s kitchen, and I get it. That is why I learned how to cook and prepare my own meals. Don’t get me wrong. I go out to eat from time to time, but mostly for the convenience. That is why I started this blog and decided to share many of my families recipes. It’s good for the soul to eat real food as often as you can. And not pay top dollar for something that is merely convenient. There is nothing quite as comforting and delicious as a home cooked meal. And in today’s economy, it pays off in twice the dividends. If you are reading this blog, chances are you love to cook and eat well. So I might be preaching to the choir. But there are those among us who may never get the chance to know how wonderful a good home cooked meal is. Some may be our friends, others our children. Teach them, show them, that some of the simple pleasures in life is as close as their kitchen. And it doesn’t start with the micowave oven. To make the bruschetta, take a loaf of italian bread or baguette and slice on on angle. Make about 10 slices. Toast the bread. 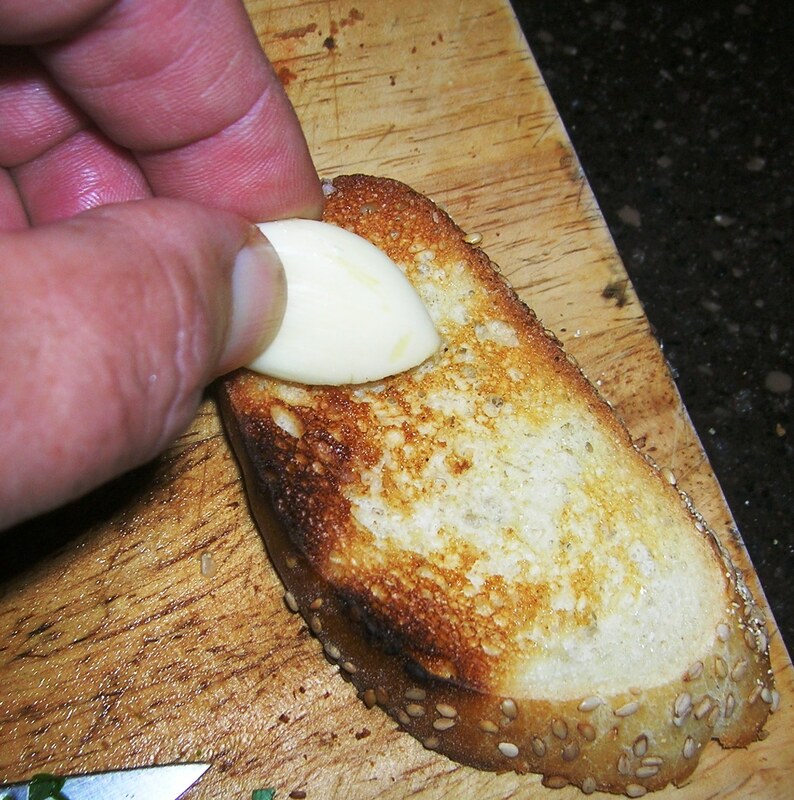 Rub a whole garlic clove on the toasted bread, on both sides, then drizzle on some extra virgin olive oil. Set aside. You should use up about 2 cloves of garlic doing this. Wash and scrub the mussels well and pull of the “beard” that may be attached to some mussels towards the narrow end of the mussel to remove. Discard any mussel that does not close when tapped or is fully opened.. 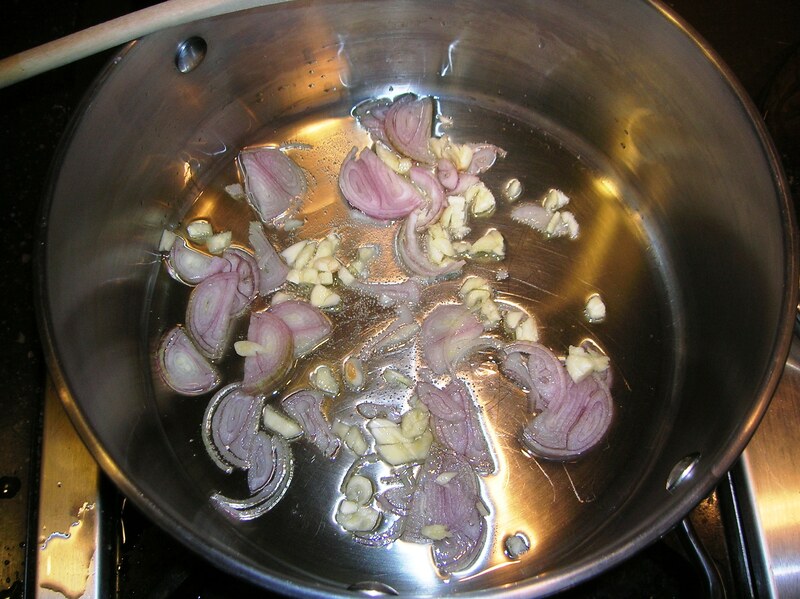 In a large pot heat the 1/4 cup of olive oil on medium flame and add the shallots and chopped garlic. Cook till garlic is golden. 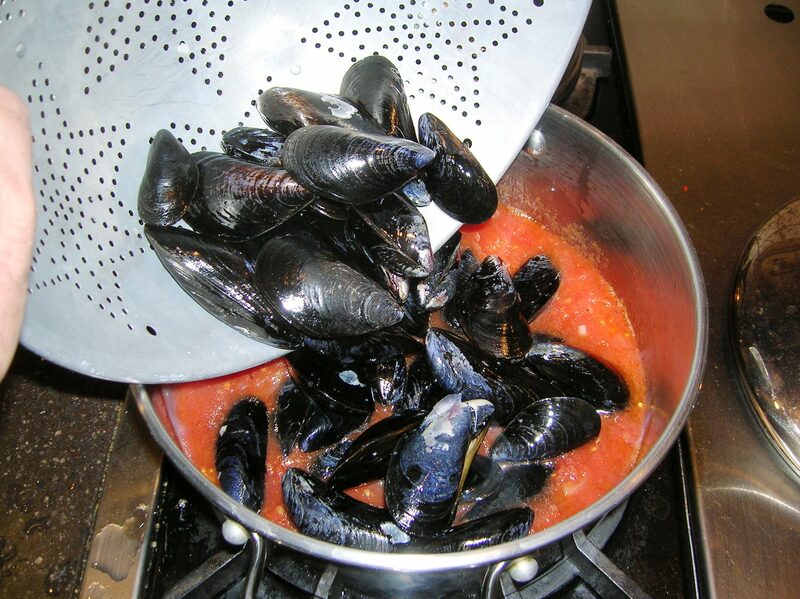 Add the wine, tomatoes, ground black pepper,pepper flakes, salt, and the mussels. Cover the pot and steam for about 15 minutes, stirring the bottom shells from time to time to ensure they are evenly cooked. Discard any mussels that do not open. 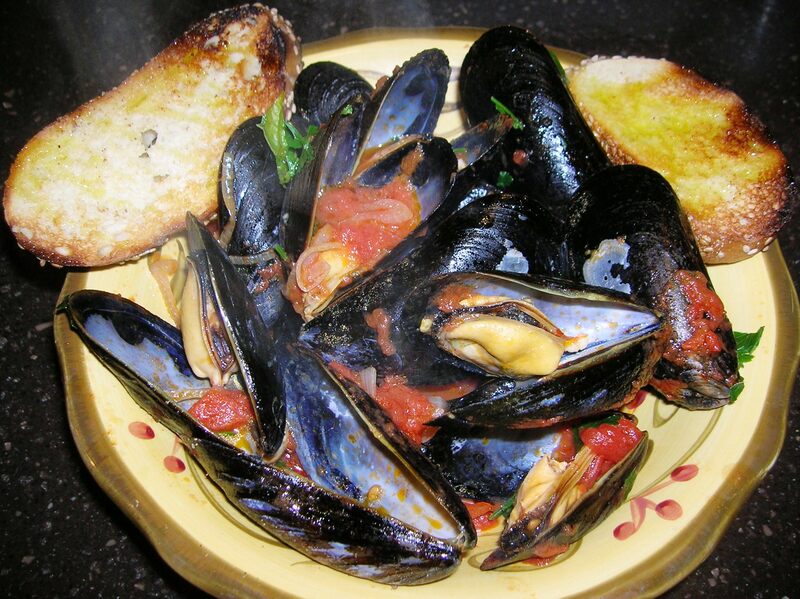 When the mussels have opened, stir in the chopped parsley and basil.Place the mussel soup in individual bowls and place two slices of bruschetta on each bowl, and serve. The bruschette is great for dipping in the soup and picking up all the little pieces of shallot and garlic. MMMM! 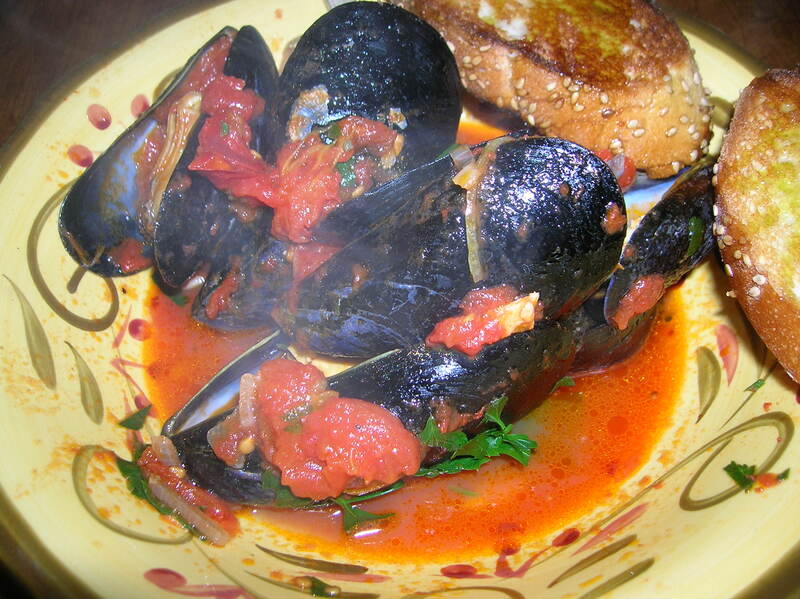 This entry was posted in Seafood, soup and tagged macaroni, Michael Savage, mussels, mussels in tomato wine sauce, Pasta, zuppa di cosse. Bookmark the permalink. Pete….I feel the same way- can you imagine going out to eat and ordering spaghetti and meatballs…..that would be criminal! But I can always go for a side dish of garlic and oil! Worse than that! Ordering spaghetti and meatballs at a diner. Sorry to diagree old friend, the fact that Italian food and culture has permiated american culture is a tribute to our heritage. Our ancestors conquered the world, first through strenght and might, and then with our cuisine……. Frank, it is a trubute to our heritage but it has morphed into something else. Let’s keep it real. Man, my grandmother was from Sicily and she made the most incredible meatballs I ever tasted, like you wouldnt believe. Sadly, she didnt leave a recipe for me so I’ve been trying to work it out by myself… slowly working my through the meatball recipes here, I still cant figure out what her secret ingredient was though!!! Happy Valentine’s Day Peter !!! I’m making this for an appetizer tonight. I rather cook on Valentine’s day. Thanks again for this recipe….it was a big hit on Christmas Eve! Thank you Karen. Happy Valentine’s Day! 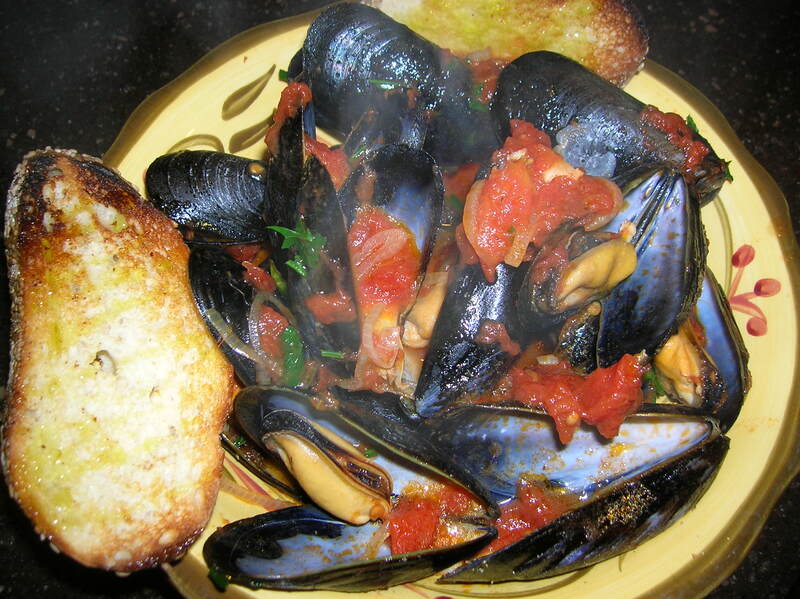 What could be more romantic than Zuppa di Cozze!